This is it! 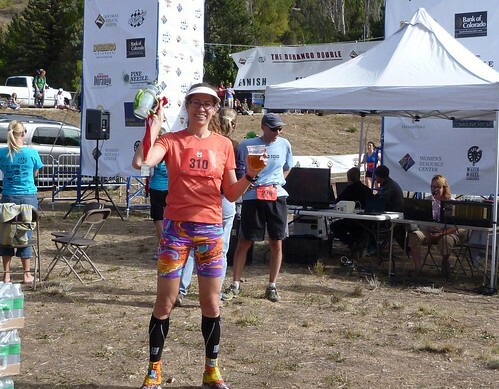 The weekend of the Durango Running Festival, resurrected from the ashes of 2006 by race director Matt Kelly and the sponsorship of the Animas Surgical Hospital. When I ran the marathon portion (only) in 2006 I thought that it might be fun the following year to do the "double half" - the 25K trail race on Saturday and the half marathon on Sunday - but then the race went out of business. When it was announced that the Durango Double was being revived, I jumped at the chance. Final stats: gun time 2:21:54, chip time I was the 5th woman finisher (out of 71), and won a pint-glass trophy for 1st in age group 40-49F, but actually the 3rd woman overall was in my age group (she is 41, though, and I am 49!) so I'm really second - but they don't "double-dip" the awards. I was the 25th human being to finish, out of 116.